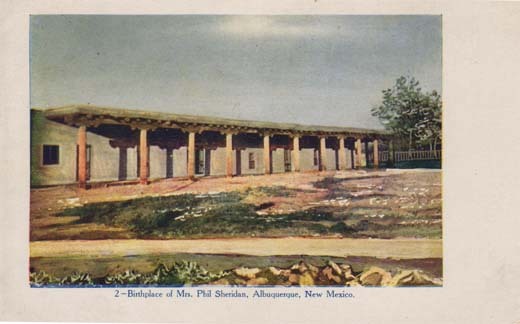 Birthplace of Mrs. Phil Sheridan, Albuquerque, New Mexico. Space for one cent stamp. 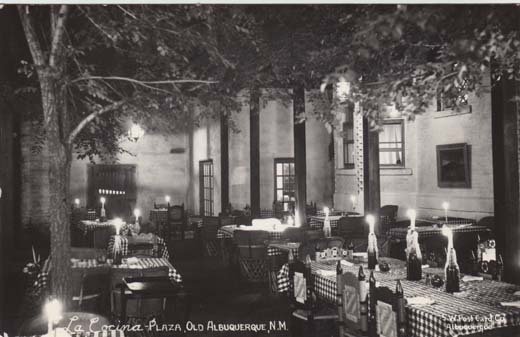 Howard Bryan wrote an "Off the Beaten Path" column in the February 5, 1959 Albuquerque Tribune, using material from newspaper accounts of Sheridan's visit to Albuquerque on December 3, 1885. Sheridan came for the purpose of checking on the house where his wife, Irene Rucker Sheridan (1856-1939), believed that she had been born. She was the first daughter of Major (later Brigadier General) Daniel H. Rucker, who was assigned to the Albuquerque garrison as the quartermaster. Biographical information about Mrs. Sheridan appears on the website of the Arlington National Cemetery, where the two are buried. 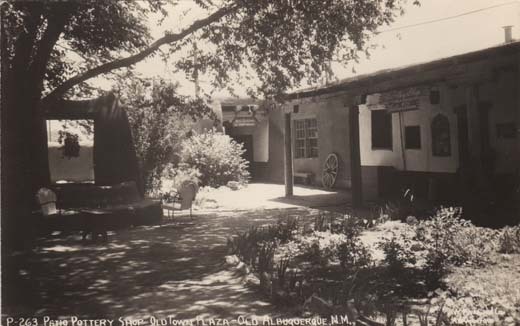 When Sheridan inspected the house, a passerby informed him that Irene had not been born there, but at Fort Union, N.M. Two younger sisters definitely were born in the house, in the short time before the Civil War while the Rucker family was posted in Albuquerque. The couple were married in 1875, when he was 44 and she was 19. They had four children before he died in 1888. 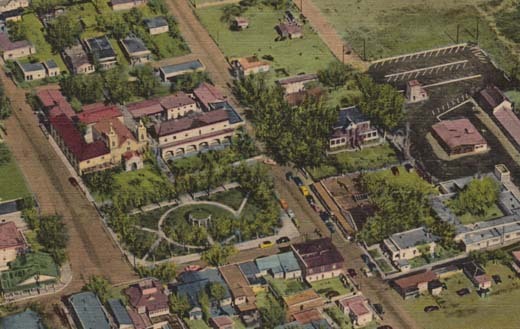 One son had a military career which brought him to Columbus, NM after the Villa Raid. 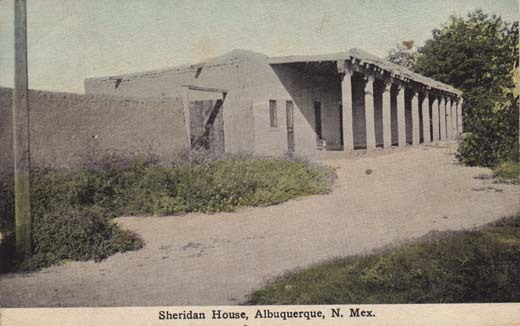 Sheridan House, Albuquerque, N. Mex. W. E. Bauer, Albuquerque, N. Mex. 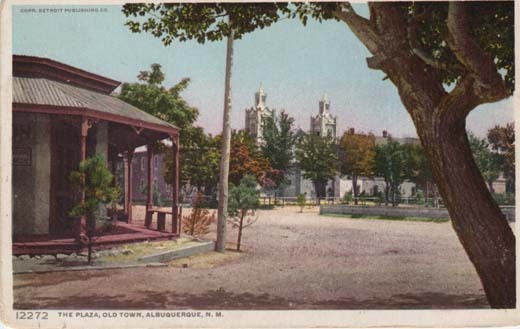 The Plaza, Old Town, Albuquerque, N. M.
Space for one cent stamp; “PHOSTINT” CARD; Trademark, Reg. U.S. Pat. Off. 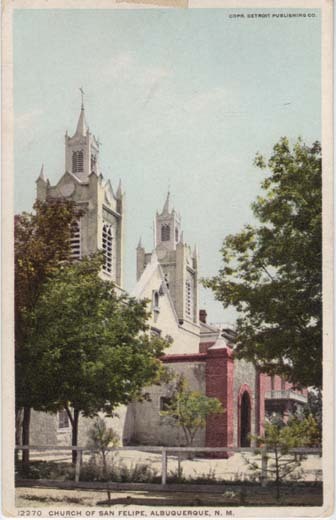 The Church of San Felipe De Neri, On the Plaza, Old Albuquerque, New Mexico. 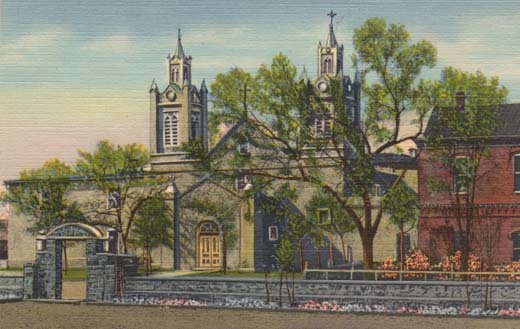 Originally built by the Franciscans in 1706-7. The old Spanish garrison building adjoins the church and the original adobe walls still stand, though now covered with a brick facing. The building is now used by the Jesuit Priests as their home. Church of San Felipe, Albuquerque, N. M.
The old church of San Felipe faces the plaza in “Old Town” at Albuquerque. It was founded several hundred years ago; services are still held there. Countless throngs have passed through its ever open doors. How much happiness and how much sorrow it knows, one can only guess. 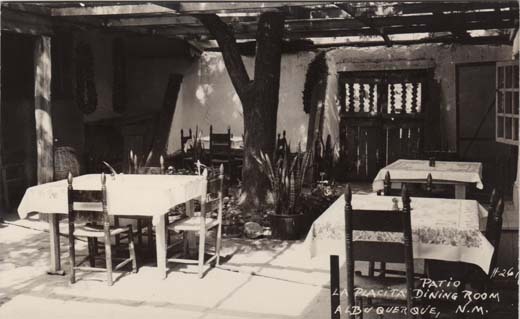 Patio La Placita Dining Room, Albuquerque, N. M.
La Cocina-Plaza, Old Albuquerque, N. M.
In this old Town Plaza was founded the City of Albuquerque in 1706. The church facing the Plaza is San Felipe de Neri, which still has the original walls, five feet thick. 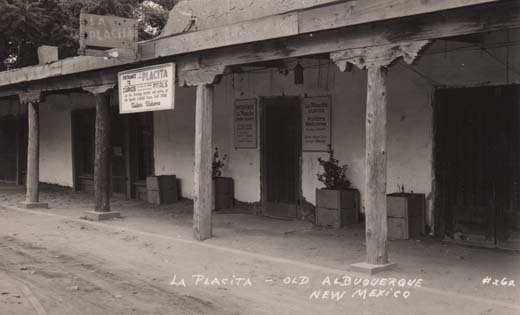 Surrounding the Plaza are quaint specialty shops and famous eating establishments.